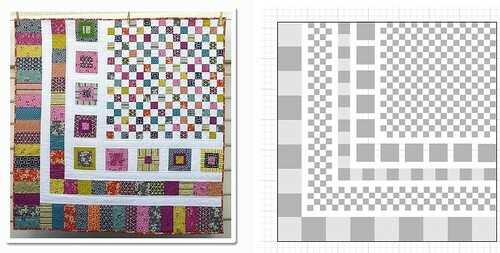 This quilt will have a very long gestation period. This is the second of two sets of quilt pieces that Hallie is letting me finish. 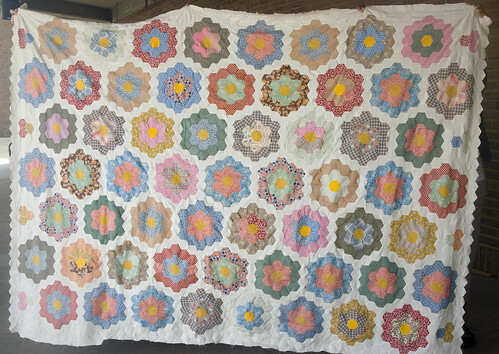 These are entirely hand-pieced in white thread by someone with very neat and clean hand-sewing, and the fabrics are 1930s -- many of them are probably feed sacks. Like 'Continuity,' Hallie's family thinks these were made either by her great-aunt or her great-grandmother. Any more specific information has already been lost. I admit, I'm more than a little stumped here. I've promised to make a kid quilt for someone (long story why I'm being fuzzy on details, but it is intentional) and I've got a set of fabrics to work with, but oh am I unsure of what to do. Care to meet the players? Read more about Stumped. Ideas? Read more about Where's your sash, Miss America? Sunday afternoon. I've done almost no sewing this week; I've been mentally drained out of proportion to my actual physical tiredness. Jeff and I took our first stab at geocaching yesterday with mixed results, but we intend to try again; today we caught a morning matinee of 'Sherlock Holmes' and then made a quick grocery run before heading home. Jeff sleeps right now, having stayed up a good chunk of the night while the storms were rolling through. The cats, fed, are hunting for warm places to nap. A good Sunday, overall.